The Twitter filter in your Brand Monitoring Mentions feed offers an easy way to follow your brand's mentions on Twitter. This will help you get a sense of your online reputation. 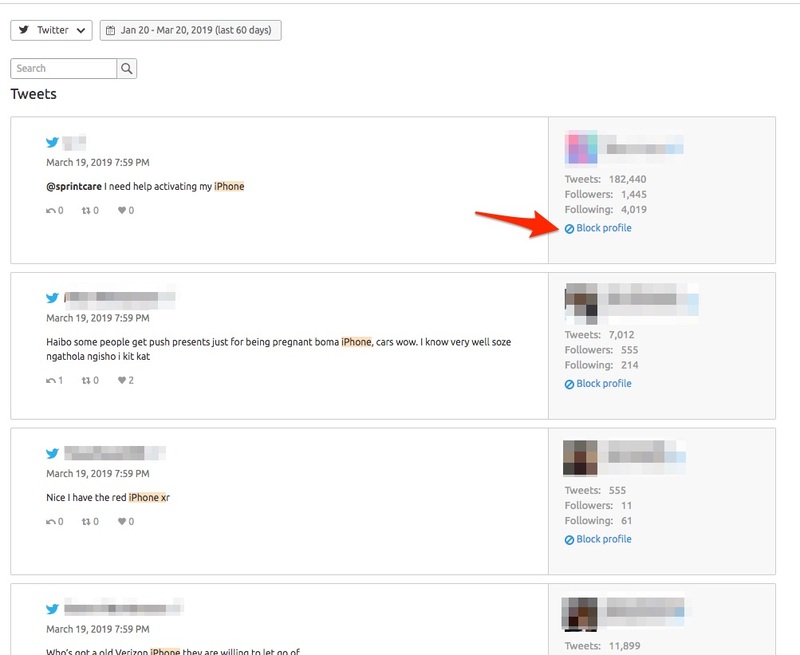 Brand Monitoring updates with new Twitter mentions every 30 seconds. All of these mentions are in real time so you’re never out of the loop. If you want to see how a campaign is being discussed, search through your Twitter mentions by a specific word. Let’s say you just recently started a campaign focusing on the MacBook Pro. You can use Twitter search for the keyword “MacBook Pro” to see all of the tweets that mention MacBook Pro. 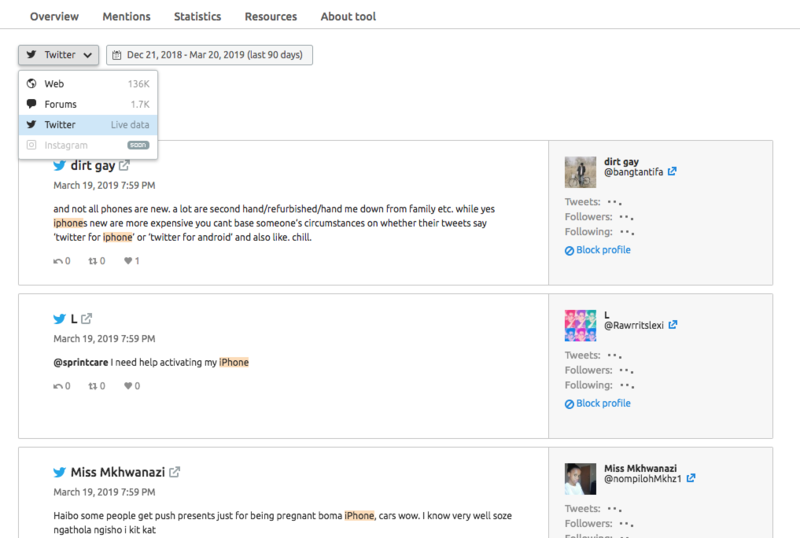 The search function can also be utilized by specific hashtags as well as by usernames. With the hashtag search, you can evaluate how trending hashtags are being received and how influencers are tweeting about them. Not only can you search and monitor your own mentions but you can also analyze trends across your entire industry. If you notice a trend is beginning to take off, you could create a campaign strategy around that trend. If you want to block Twitter mentions from a specific profile, select "Block profile" in the box to the right of the mention. There are two labeling options when blocking a Twitter profile: Irrelevant and My Profile. Either one will remove the selected Twitter users tweets from appearing in your campaign. Once selected this twitter handle will now be labeled accordingly in the Resources tab. If you're active on Twitter and don't want your tweets crowding your feed, block your own profile with this simple step. This can also help your block our your mentions and replies. After blocking a profile page, it can be found and unblocked in the Resources tab of the tool. Check out the Social Media Tracker to track the Twitter and other social media profiles of your competitors.